An improperly or incorrectly tied bull rope can put the bull rider at unnecessary risk while he is competing. Bull ropes are tied onto bulls before rides and used to give the rider some form of support and security while on the bull. If the rope is tied wrong, the rider could get hung up in it or the rope can interfere with the ride. Tying a bull rope knot correctly is fairly simple. You should be able to tie a good quality knot with a little bit of practice. 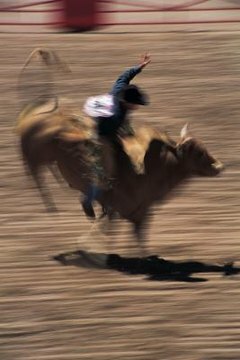 Loop your bull rope around the nearest fence rail. The bull rope has two ends. One end has a loop, the other end is the tail. Take the tail end of the rope and pull it underneath the fence rail and then bring it across the front of the remaining section of rope. This should create a loop next to the fence rail. Take the tail end of the rope and push it down through the loop you have created and use the loop end of the rope to pull the knot tight. Straighten out and adjust your knot by applying tension on it. Locate the center part of the loop section of your rope. Grip the loop in your hand and stretch it out at arms length. Mark the length of rope by tying a simple overhand knot in the loop at the end of the area where your arm reaches.